Suiting aptly to the quote, the communication is the one of the major drivers of most businesses. With the world shrinking due to globalization, the face of business communication is making a shift from lengthy documents to crispier and instant information, to meet the instant communication demand. Presentation is one such tool, which helps structure one's thoughts in an effective way. That is why presentations are increasingly used in the corporate world. Recent numbers suggest that about 30 million PowerPoint presentations are created everyday. Figures also show that the number of PowerPoint presentation users is about 500 million. Though internet is the best mode of to send these presentations to meet instant communication needs across geographies, the heavy size of PowerPoint, speed of internet and the sense of losing control over the presentation are major hindrances to meet the objective. Briefly, authorSTREAM can be a solution to all the presentation-sharing problems in the world of communication. authorSTREAM is a technologically advanced company exhibiting the attributes of a true Web 2.0 company. AuthorSTREAM is a user generated presentation site that empowers the author to reach its viewers directly. It also gives the freedom to embed presentation in one’s blogs, download to ipods, or share on youtube. One does not need to have PowerPoint to view the presentation or worry about the space problem to store these presentations. 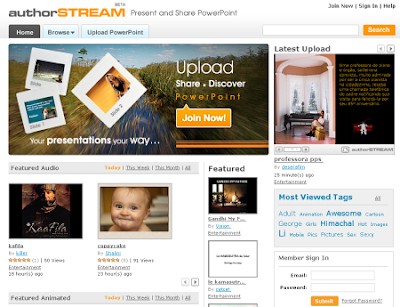 authorSTREAM provides the facility to view a presentation to the viewer even without having PowerPoint on the system. The presentation management feature of authorSTREAM gives relief from disk space problems and retrieval of scattered presentations on the disk. authorSTREAM is a great online community that gives access to numerous presentations on varied subjects uploaded by community members. The site has already registered 8,00,000 views in just seven months of its introduction. The total number of presentations uploaded on authorSTREAM is 50,000. One can find exciting presentations on just about any topic, rate them, post a comment and even download them if the author has given the permission. Besides satiating author’s urge to reach the viewers directly without intervention of publishers, authorSTREAM proves to be a strong tool for marketing/ Sales professionals to share presentations with their clients in an effective and simple way. authorSTREAM doesn’t depreciate the quality of the presentations as it is the platform which offers a number of advanced features like animation effects, sound, animated inserted images, rehearsed timings, narrations, embed code and Stats, RSS Feed and Full Screen player. authorSTREAM also provides strict security to the private presentation. Only invited registered members can access private presentations. It also means that private presentations are not indexed by the search engines, and are not accessible directly. authorSTREAM can be effectively used in areas of training, e-learning, marketing, sales, and corporate communications.